We are providing you with two maps containing ready-made entity systems. Those are the experiments that have leaked out into the world. The contest is simple: make a map to capture some the experiments. This means using at least one of the entity systems in your map, integrating them with your own gameplay ideas and design. You are free to modify them so that they act differently, look as you’d like or blow our socks off. After all, there’s nothing we’d like to contain more than mutant versions of these experiments! 1 year of supporter for the two remaining madmen. To encourage participation, prizes will unlock with more maps being submitted. Your submission must be a Zombie Escape map, with any theme and gameplay style that you would like, including at least one of the experiments contained in the lab in some inventive way. Submissions do not need to be complicated, but they should be enjoyable for the players of the Mapeadores Zombie Escape server. It is a good idea to familiarise yourself with the gameplay settings in our community so that your submission is competitive. Any map you submit should be a map you designed specifically for this contest. Previously released maps that you extend to include one of the provided gameplay systems will not qualify. 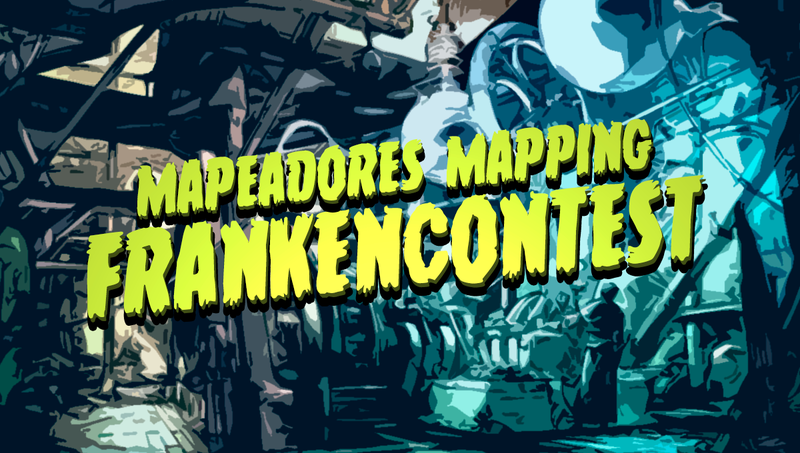 Your submission will contain the map, which you will send privately to @Morell, @Syoudous or @Enviolinador, preferably on the Mapeadores’ Discord channel. Finally, you must include the contest billboard in the map, preferably at spawn or somewhere similarly easy to spot. Maps will be rated according to design, gameplay, balance, use of the provided entity systems and fun. The rating will be done by experienced mappers and members of the community, also considering previous mapping work. We will positively reward people that publish outstanding content—beautiful sceneries, engaging gameplay, excellent level design, etc. Furthermore, showing progress will also be taken into account: presenting your own ideas so that other mappers can learn from you will play to your advantage. Your map must be submitted before Friday 29th of March, 2019. I wanna start! Where are the experiments?! The Mapeadores’ Test Lab, with all the items from ZE_SUPERSHITSHOW and novel entity systems by Mojonero, Syoudous and me. The billboard materials, in both unlit and light mapped versions; both in high resolution and middle resolution. Our lab, ‘mapeadores_test_lab.bsp’ in the file provided for the contest, is split in several rooms. We will start touring through them, starting with the room we spawn on. 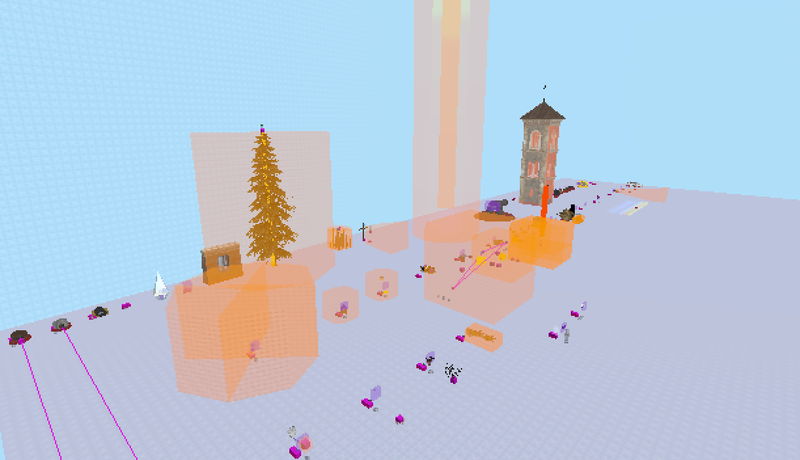 This area contains the WTF-Cannon: a fully amiable weapon that spawns explosions on sight. Its line of sight can be blocked by world geometry or physics objects, and the explosions also damage func_breakable and hurt players. You can easily control what it spawns by editing the logic_script associated with the entity! If the weapons simply have no defined value, or we set ::WeaponClassAmmo to be empty, the default is 1 bullet, as seen at the very last part of the screen. Here, you ackshually have two systems: a system that detects snowball projectiles recently added to the game to trigger things, and a script-based counter that counts to 10. The counting is easy to copy and move around to other projects, and you can trigger actions when the value is reached. An interesting idea would be to edit this and, perhaps, use it for a boss or a puzzle! A secret... What a secret! This is a single-player input controller that can detect if a correct password is input. The mapper can easily control inputs and outputs both on failure and success. This is done with the OnUser3/OnUser4 event outputs. The system can be used for other means if you limit the possible letters and change the target string, which represents the password. For instance, it could be used for a quiz system that requires users to answer A, B or C! This is just a garden, covered with two cheap pieces of plywood. If you come out, it might get toasty. If you get toasty from the green kind of toaster, you will get a cool notification in the corner, which may give you additional ideas on how to make your maps cooler. Both red and green toasters will only target you if you are in their line of sight, and you can control how fast they move. They can also be parented, but our scientists thought that would be better if left to the mappers to experiment! Triggers that detect your grenade and push you in the direction opposite to the one that the grenade is following. This opens up a new kind of skill-based movement for ZE players, entered around bouncing against surfaces with nades! An HP-filtered teleport trigger, which you could use to separate the ‘good’ players that do not fall/take damage in a skill-based map from the noobs. The shifter, an item that lets players control their speed and gravity. There are no speed or gravity limits on it, so a player might use it to fly very slowly and trigger while the team holds, or rush to the next button. Just a closet with a Bizon inside. Pressing E seems to spawn an entity exactly where the player is looking, provided the player is holding a gun. This is interesting, because it opens up the door for aim-based items that target whichever player we want to target! Further and Beyond: The SuperShitShow Grounds! Human barricades, in the same style as Minas Tirith. A simple unkillable NPC, the UFO, which targets the nearest players and will wipe them off the face of the earth with its super-powered laser. A cannon to blow things up in the distance, shooting physical explosive projectiles. 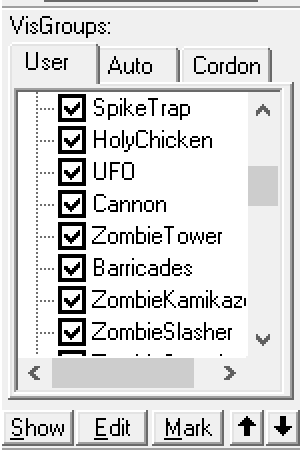 Several zombie items, including the Tower, Crate, Kamikaze, Slasher, Sword guy, Ladder, Jumper, and Energy. Several human items, including the Flamethrower, Ice-gun, Pushgun, Pulverizer, Wall-spawner, Push-away Light, Ammo Box, Blinding Lamp, Spike Maker, Tree Bomb, Flying Bird, Explosive C4, Giant Saw, Chicken-Cross Spawner, and Speedy Car! Enjoy the content and have fun making maps for the contest! For any doubts, issues or help you need, we are in the #mapping channel of Mapeadores’ Discord! What a timing… I was thinking about creating something else than Jailbreak maps! Good luck, and thanks for the opportunity ! Hi. I present to you 1,028 models, 4,011 files in 59 folders at a total of 129mb. These are for you guys, for your mapping pleasure in general. I did this in little under a week initially. I’ve been mapping for CS:GO (with, nothing produced or anything specific to mention) pretty much since its initial launch and have seen assets come and go, be arranged, know and recognize where some of the things come from within CS:GO. I managed to pull these assets from Half-Life 2, Half-Life 2: Episode 2, Counter-Strike: Source, Day of Defeat: Source, Left 4 Dead 2, Portal 2 and the CS:GO initial beta. All the props here have their textures in the game and what makes it easy is any old file packer (Pakrat) will recognize these files and pack them appropriately with their textures already in the game and with no waste. The files are recompiled over using a different path (/models/additional_models/…) and CS:GO’s model compiler with their file sizes made to be as small, unnoticeable as much as possible. Some skins/variants are added and some… are missing but replaced! There’s a few fluorescent light props that have no lighting but are compiled as “_off” for example. There is a lot of unused textures and assets in CS:GO since release and I think even though Valve themselves tried to clean up their game there’s still a lot of things leftover and probably unlikely they’ll clean or delete anything anytime soon as it’ll just cause issues for them and everyone later. So this is where this model pack comes in making the most out of everything. I’m also including 1,061 materials. This was presented by “Rules of _p” awhile ago and it’s sort of a community effort to make use of what’s available in the game. Some custom masks are my own doing but everything else is making the most out of what the game offers. Especially with using $detail as Valve developers use it heavily now for their newer textures. Sneak peak of available models. Let me know if there’s any issues. I appreciate the feedback on Discord (Syoudous#7747) or Steam, preferably) if anything is missing or wrong. Something to note that I forgot, some textures are purposely black/gray. I replaced a few of them but that’s how they were found and used. They’re a plain vanilla black texture here as well. So unless you see something in your console… just a heads up. Ideally they’re meant for fog or something in the skybox. Not actual player interaction.